Today I present two regular charts that unfortunately give me little information this month about what could be occurring in the housing market. They show the UK markets just treading water for the month. The first shows the monthly interest rate of UK resident banks and building societies sterling standard variable rate mortgage to households (not seasonally adjusted) and highlights that for this data set rates remain at near record lows at 4.05% for March 2010 (actual low was 3.82% in April 2009). This is static compared to the previous month. Compare this with the consumer price index (CPI) of 3.0% and importantly the retail price index (RPI) of 3.7% and it says that the average mortgage is almost free money. UK 10 year bond yields are now even at 4.05% so I just don’t know how much longer mortgage rates can remain this low. Who today would you prefer to get your yield from – the average home owner or the UK government? The answer should normally be easy but given the state of the UK public finances you might have to think twice today. 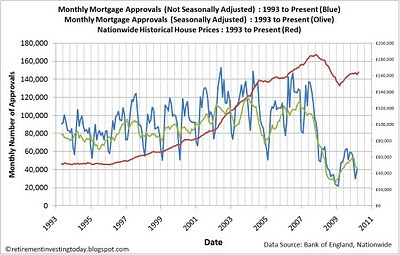 The second chart shows mortgage approvals. 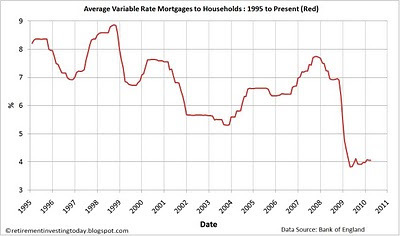 Non-seasonally adjusted rates are up month on month by 36% to 40,622 for February 2010 however as the chart shows this is a very noisy and erratic data set. 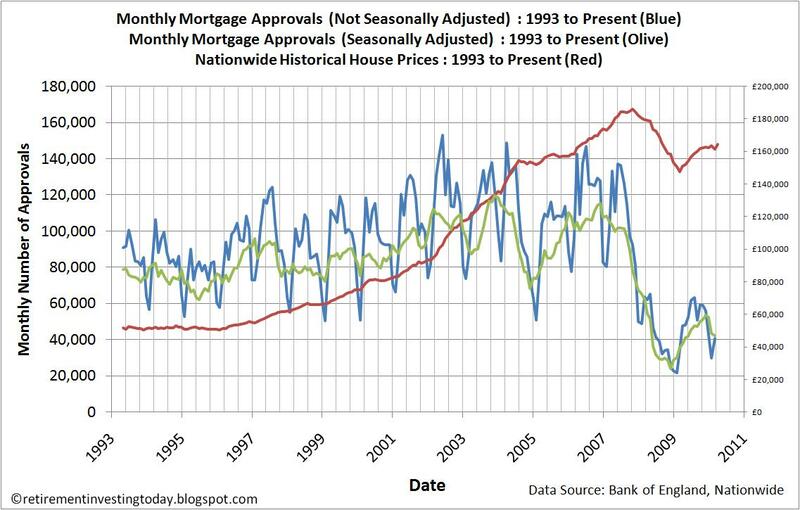 Seasonally adjusted shows mortgage approvals as almost flat by being down only 2% to 47,094 for February 2010. 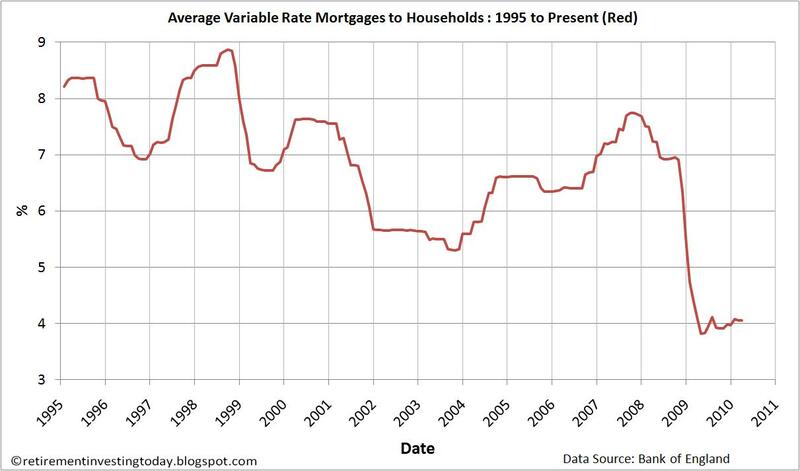 It’s interesting though that even with almost free money on offer mortgage approvals are not really rising. Can the Labour government and Bank of England keep the plates spinning much longer? It’s certainly going to be interesting to watch what happens to the housing market over the spring period. Click here for a £100 sign up bonus with RateSetter. I've been investing since 2014 with annualised returns of 4.2% to date. Your capital is at risk with peer-to-peer lending so please do make sure you do your own research first. Are we back to blowing asset bubbles already? Where is the economic recovery? © 2009 - 2016 Retirement Investing Today. All rights reserved. Information on Retirement Investing Today is not financial advice. The Site provides general information only and should not be used for making (or not making) any investment decisions. Please seek your own appropriate independent advice before making any investment decisions. We cannot accept any liability for any loss suffered by people reading this Site and making decisions from its contents. Retirement Investing Today may include affiliate links, sponsored posts and advertisements for which we may receive payment. Readers are fully responsible for any actions taken as a result of reading or clicking on links on this Site. Please always do your own research.